jhon is using Smore newsletters to spread the word online. One of the fundamental goals of physics is to investigate something that everyone talks about: energy. The topic IS obviously important. Indeed, our civilization is based on acquiring and effectively using energy.For examples Physics help everyone knows that any type of motion requires energy Flying across the Pacific Ocean requires it. Lifting material to the top floor of an office building or to an orbiting space station requires it. Throwing a fastball requires it. We spend a tremendous amount of money to acquire and use energy. Wars have been started because of energy resources. Wan have been ended because of sudden. overpowering use of energy by one side. Everyone knows many examples of energy and its use. but what does the term energy really mean? object to another, but the total amount is always the same (energy is conserved).No exception to this principle of energy conservation has ever been found. Think of the many types of energy as being numbers representing money in many types of bank accounts. Rules have been made about what such money numbers mean and bow they can be changed. You can transfer money numbers from one account to another or from one system to another. perhaps electronically with nothing material actually moving. However, the total amount (the total of all the money numbers always be accounted for:It is always conserved. In this chapter we focus on only one type of energy (kinetic energy) and on only one way in which energy can be transferred (work). In the next chapter we examine a few other type of of energy and how the principle of energy conservation can be written as equations to be solved. 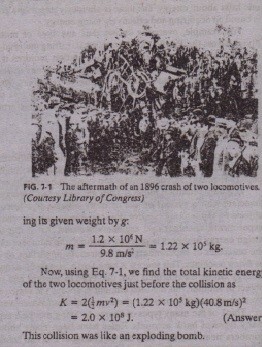 Kinetic energy K is energy associated with the stAte of of an object. The faster the object moves, the greater is its kinetic energy When the object is stationary, its kinetic energy is zero. r For an object of mass m whose speed v is well below the speed of light . For example, a 3.0 kg duck flying past U& lit 2.0 mls has a kinetic energy of 6.0 kg· m2/s2:that is, we associate that number with the duck's motion. The SI unit of kinetic energy (and every other type of energy) is the Joule (J) named for James Prescott Joule, an English scientist of the 1800s. It is defined directly from in terms or the units for mass and velocity. 1 joule = 1 J = 1 kg· m2/s1. Thus, the flying duck has a kinetic energy of 6.0 J. If you accelerate an object to a greater speed by applying a Coree to the objec you increase the kinetic energy K (= mv2) of the object. Similarly, if you dece erate the object to a lesser speed by applying a force, YOIl decrease the kinetic energy of the object. We account for these changes in kinetic energy by saying that your force mass transferred energy to the object from yourself or from t object to yourself. In such a transfer of energy via a force, work W is said to a one on the object by the force. More formally, we define .work as follows . the object is negative work. Work," then, is transferred energy: "doing work" is the act of transferring the energy. Work has the same units as energy and is a scalar quantity. orne term transfer can be misleading. It does not mean that anything material flows into or out of the object; that is. the transfer is not like a flow of water Rather. it is like the electronic transfer of money between two bank account The number in one account goes up while the number in the other account g down, with nothing material passing between the two accounts.Note that we are not concerned here with the common meaning of the wor "work," which implies that any physical or mental labor is work. For example, you push bard against a wall, you tire because cf the continuously repeated m de contractions that are required, and you are, in the common sense, working. However. such effort does not cause an energy transfer to or from the waU and thus is not work done on the wall as defined here. To avoid confusion in this chapter, we shall use the symbol W only for work and shall represent a weight with its equivalent mg.
Let us find an expression for work by considering a bead that can slide along a frictionless wire that is stretched along a horizontal x axis . A constant force F. directed at an angle I/>to the wire, accelerates the bead along the wire. We can relate the force and the acceleration with Newton's second law, written for components along the x axis. where m is the bead's mass. As the bead moves through a displacement d, the force changes the bead's velocity from an initial value Vo to some other value v. Because the force is constant, we know that the acceleration is also constant. Thus, we can use Eq. 2-16 to write. for components along there axis . If we know values for F, and d. we can use this equation to calculate the work W done on the bead by the force. Because the right side of this equation is equivalent to the scalar (dot) product,we can also write. where F is the magnitude of F. (You may wish to review the discussion of scalar products in Section 3-8.) Equation 7·8 is especially useful for calculating the work when F and J Are given in unit-vector notation. Cautions' There are two restrictions to using through 7-8 to calculate work done on an object by a 'force. FU'St.the force must be a constant force; that is, it must not change in magnitude or direction as the object moves. (Later, we shall discuss what to do with a variable force that changes in magnitude.) Second e object must be parade-like. This means that the object must be rigid parts. of it must move together, in the same direction. In this chapter we consider only particle-like objects, such as the tied and its occupant being pushed in Signs for work. 1be work done on an object by a force can be either positive work or negative work. For example, if the angle is less than 90", then cos is positive and thus so is the work. If is greater than 90" (up to lro'), then cos ~ is negative and thus so is the work. (Cal\you see that the world is zero when = 90"?) These results lead to a simple rule. To find the sign of the work done by a force, consider the force vector component that is parallel to the displacement.